SEPTEMBER 2013 – “Everyone can make a difference, and help save our environment,” says Basuki Budi Santoso, Friends of the National Parks Foundation’s (FNPF) general manager in Kalimantan. 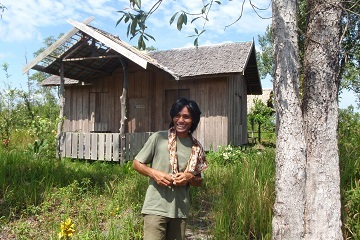 It is belief that fuels his passion to help save Indonesia’s rapidly disappearing forests. FNPF's Kalimantan General Manager Basuki Budi Santoso in front of our base camp at Jerembun, near Tanjung Puting National Park. The 40-year-old spends his working days trekking through the forests, and working with the communities, who live around Kalimantan’s Tanjung Puting National Park – the largest protected area of tropical heath and peat swamp forest in SE Asia – and the Lamandau River Wildlife Reserve. FNPF runs several conservation projects in both areas. Basuki tried out many ways to making a living before coming to work for FNPF – he has spent time as a researcher, road contractor, coal surveyor, and timber worker. He worked for various NGOs in the conservation and community development fields, including WWF Indonesia and Care International. “I’ve changed jobs 12 times but FNPF is a special place for me. FNPF starts from the bottom and does not only focus on the fashionable issues. It adopts a holistic approach taking into account the needs of the local people,” says Basuki. His daily tasks involve planting trees, soil and water conservation, and community reforestation. In the last decade FNPF – with the help of dedicated people like Basuki – has planted more than 150,000 saplings within Tanjung Puting, and over the last two years almost 30,000 saplings in Lamandau. Each tree we plant is monitored and cared for for three years – by Basuki and his team – to ensure at least 70% survive. The best part of his job is having the chance to work with local communities to achieve results and tackle environmental problems, of which there are many in Indonesia. He feels the communities who live in and around the forests are not adequately protected and the welfare of forests is left to the communities themselves. “Taking FNPF’s holistic approach as a guide, my goal is to make reforestation methods easy, inexpensive, and effective.” Basuki says that low-cost conservation projects can be run by small NGOs with limited funds and also by local communities. Basuki and a local teacher explain conservation issues to a group of school children. Basuki, who has worked for FNPF for nine years after staring as a volunteer, says his most important insights come from living day-to-day in the forest – and he believes effective reforestation is about more than just replanting. For reforestation to work it must have economic benefits and provide alternative incomes sources for local people. As well it must involve educating young people, and must tackle gender equality issues. One of FNPF’s key focuses in Kalimantan is helping local communities learn alternative ways to make a living so they do not need to take part in destructive activities such as illegal logging, and palm oil cultivation. Those options include eco-tourism, agroforestry, and organic farming. Young people – the leaders of the future – are also an important focus of FNPF’s work. “Everyone can make a difference. We teach children about deforestation, endangered animals, and build their awareness of conservation issues,” says Basuki. FNPF thanks our generous donors who support our work in Kalimantan – the Humane Society International (Australia), who has supported us for more than 14 years, Boeing, Taronga Foundation, Buy One Give One, Save Indonesian Endangered Species, Eco Future Fund Japan, and many others. You can support us by donating through our website, or by gifting urgently needed equipment, such as GPSs, fire extinguishers, tents, hammocks, grafting knives, hoes and gloves. FNPF receives no government funding and relies on the support of its volunteers and donors to carry out its work.